Waikato (/ˈwaɪkɑːtɔː/ or /ˈwaɪkætoʊ/) is a local government region of the upper North Island of New Zealand. It covers the Waikato District, Hauraki, Coromandel Peninsula, the northern King Country, much of the Taupo District, and parts of Rotorua District. It is governed by the Waikato Regional Council. The region stretches from Coromandel Peninsula in the north, to the north-eastern slopes of Mount Ruapehu in the south, and spans the North Island from the west coast, through the Waikato and Hauraki to Coromandel Peninsula on the east coast. Broadly, the extent of the region is the Waikato River catchment. Other major catchments are those of the Waihou, Piako, Awakino and Mokau rivers. The region is bounded by Auckland on the north, Bay of Plenty on the east, Hawke's Bay on the south-east, and Manawatu-Wanganui and Taranaki on the south. Waikato Region is the fourth largest region in the country in area and population: It has an area of 25,000 km² and a population of 468,800 (June 2018). The region encompasses all or part of eleven territorial authorities, the most of any region of New Zealand. It is centred on the Waikato which consists of Waikato District, Matamata-Piako District, Waipa District, South Waikato District and Hamilton City. 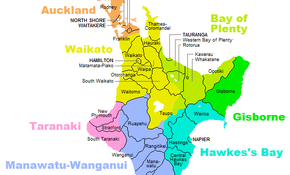 In descending order of land area the eleven territorial authorities are Taupo District (part), Waikato District, Waitomo District (part), Thames-Coromandel District, Otorohanga District, South Waikato District, Matamata-Piako District, Waipa District, Hauraki District, Rotorua District (part), and Hamilton City. When Waikato is used in spoken language it takes the definite article: the Waikato. But this usually refers to a smaller region than the Waikato local government region. Two definitions that would meet with wide acceptance are those of the Waikato rugby football union and of Hamilton Waikato tourism. The former takes in the local government areas of Hamilton City, the southern part of Waikato district, Waipa district, most of Matamata-Piako district and the South Waikato district. Hamilton Waikato tourism takes in additionally the northern part of Waikato district (Tuakau and other centres), the northern King Country (Waitomo and Otorohanga districts), and the Te Aroha district. The parts of Waikato region beyond these limits are usually identified as Thames Valley and/or Hauraki/Coromandel (for the north-eastern part of Waikato region) and Taupo, on the Volcanic or Central Plateau (for the south-eastern part of the region). The largest city in the Waikato Region is Hamilton, with an urban and peri-urban population of 203,100 (June 2018). It is home to the University of Waikato and the Waikato Institute of Technology (Wintec). Other major towns in the region are Tokoroa, Te Awamutu, Cambridge and Taupo with respective populations of 14,050, 17,500, 20,600 and 24,700. (These populations include the urban and peri-urban areas). The region also includes the smaller towns of Huntly, Matamata, Morrinsville, Ngaruawahia, Otorohanga, Paeroa, Putaruru, Raglan, Te Aroha, Te Kauwhata, Te Kuiti, Thames, Tirau, Tuakau, Turangi, Whangamata and Whitianga. The Waikato Region is the fourth largest regional economy in New Zealand after Auckland Region, Canterbury Region and Wellington Region. Gross regional product (GRP) for the year ended March 2007 was estimated to be $15,606 million compared with $12,493 million in March 2004. Between 2000 and 2004, Waikato economic growth was lower than the national average. But from 2004 to 2007, real gross regional product for the Waikato Region increased by 5 per cent per year compared with 3.2 per cent for the national average. This faster growth can be attributed to rapidly growing dairy and business services industries, facilitated by proximity to the Auckland city, the main international gateway for New Zealand. Dairy farms are mainly family owned (2,608 of 4,020 farms in 2016) with owners employing sharemilkers in many cases (1,412 sharemilkers). The size of the average dairy herd in the Waikato has progressively increased. It was about 320 cows in 2012 and in 2016 was about 351 (total Waikato herd 1.41m cows), milked in either a herringbone or automated rotary cowshed so a large herd can be milked in under two hours. The cows are kept on grassland pasture all year due to the mild climate. In the Waikato the original English grasses used by earlier settlers – browntop, fescue and Yorkshire Fog – have been replaced with higher producing Italian ryegrass and nitrogen-fixing white clover. Farmers use a variety of supplementary feeds in winter or during the infrequent summer droughts. Main feeds are hay, grass silage and chopped corn feed. The later is often fed out on a concrete pad to save transportation and wastage by trampling. In 1840 44 Waikato chiefs travelled north to the Manukau Heads and Manukau Harbour to sign the Treaty of Waitangi, officially making the Waikato area part of New Zealand. Three Ngati Maniapoto chiefs signed, as did three Ngati Haua chiefs but most signatories were Waikato. Chief Te Whero whero did not sign, "probably due to the lack of dignity compared to the Waitangi event". Unusually, the copy signed was in English. Between 1840 and 1860 the CMS missionaries of the Anglican church assisted Waikato Maori in revolutionizing their economy in the Kihikihi area by the introduction of such crops as peaches, maize and wheat. Missionaries brought in millers and helped Maori establish eight flour mills. These flourished until 1857, as they provided flour for the growing Auckland market in the 1850s and for a brief while were exporting to Australia. There were mills at Aotea, Kaitotehe, Karakariki, Kihikihi, Kirikiriroa, Kohanga, Kopatauaki, Mahoe, Mangaharakeke, Mangapapa, Mangarewarewa, Mangatawhiri, Matamata pā, Maungakawa, Maungatautari, Mohoaonui, Otawhao, Patetere, Rangataiki, Rangiaowhia, Taupo, Te Kopua, Te Rore, Tireke, Tuakau, Waitetuna, Whaingaroa and Whatawhata. The route used to travel to and from Auckland was by dray to the Puniu stream, along the Waipa River to its junction with the Waikato. Near the Waikato Heads travellers entered the small Awaroa River. During summer it was necessary to push or pull the waka through to the Manukau Harbour at Waiuku. By 1850s a small bullock track had been established to Auckland via the settlements of Mauku, Drury, Papakura and Otahuhu or waka could take the sea route across the Manukau to Ihumatao (where Auckland International Airport is now). The main tribe to use this route and the main traders were the Maniapoto tribe. They occupied an area of fertile land south of Te Awamutu at Kihikihi and Rangiaowhia. Maniapoto sold wheat, peaches, potatoes and other food to Auckland and bought back shirts, sugar, tobacco and rum. The boom time ended in 1856-1857 with the end of the Australian gold rush, allowing importing of cheaper food, especially flour, from Australia. Even in the boom time of 1854-55, food grown by Waikato Maori, such as Ngati Maniapoto, was taken to the Auckland market in very small amounts compared to food from the Waiheke Island -Thames area. In early 1855 Ngati Maniapoto took only 3 canoes of potatoes to Auckland compared to 279 canoes containing a much wider variety of food from the Thames area. Missionaries had also established schools for Maori. Benjamin and Harriet Ashwell ran a school for 50 Maori girls aged 6–17 at Taupiri in 1853. The girls had been at the school for up to 3 years and could read and write in English and do mental arithmetic. Following major floods in 1907, a Waikato River Board was formed in 1911. However, it was reported as ineffective in 1921 and ceased to operate, though the need for a replacement was considered in 1933. Hauraki Catchment Board was set up in 1946. Major floods also occurred in 1953 and 1956. Waikato Valley Authority was established by the Waikato Valley Authority Act on 26 October 1956. The Water and Soil Conservation Act 1967 extended it to become a Catchment/Regional Water Board. The Ministry of Works and Development Abolition Act 1988, left WVA with that work and it became the Waikato Catchment Board. The Waikato United Council, was formulated under the Local Government Act 1974, but due to objections excluded Thames/Coromandel district, though otherwise covered the present extent of the region. It was set up under the Town and Country Planning Act 1977 and the Waikato Region Constitution Order 1980. WUC covered Hamilton City, Huntly, Ngaruawahia, Cambridge, Te Awamutu, Matamata, Putaruru and Tokoroa boroughs, Matamata, Raglan, Waikato, and Waipa counties, Otorohanga and Waitomo districts. It took over the Hamilton Regional Planning Authority and mainly dealt with regional planning and civil defence. By 1989, WUC had committees for regional planning, civil defence, regional government, and the Waikato Regional Development Board. From 1987 it also included Thames-Coromandel District, Great Barrier Island, Hauraki Plains, Ohinemuri and Piako counties, and Morrinsville, Paeroa, Te Aroha and Waihi boroughs. On 1 November 1989 Waikato Regional Council was established by the Local Government (Waikato Region) Reorganisation Order 1989. from 40 former authorities:- 2 catchment boards (Hauraki and Waikato), 3 united councils (Waikato, Thames Valley and part of Tongariro), 12 noxious plants authorities, 11 pest destruction boards and 12 drainage boards. The Land Transport Act 1998 added transport to WRC's responsibilities. From 1 November 2010 Environment Waikato took over the southern parts of Franklin District. That seems to be the only legislation naming it 'Environment Waikato', which had been its operating name until 2011, shortly after the 'Rates Control Team' won about half the seats in the 2010 election. ^ Smallman, Elton Rikihana (20 October 2016). "Alan Livingston voted chairman of Waikato Regional Council". Waikato Times. ^ a b Swarbrick, Nancy (3 June 2010). "Waikato region – Overview". Te Ara – the Encyclopedia of New Zealand. Retrieved 10 July 2011. ^ "About the Waikato region". Waikato Regional Council. Retrieved 2011-05-11. ^ Royal, Te Ahukaramū Charles (3 May 2010). "Waikato tribes – Waikato landmarks". Te Ara – the Encyclopedia of New Zealand. Retrieved 10 July 2011. ^ "Waikato Rugby Union : Official Website". www.mooloo.co.nz. Retrieved 16 March 2018. ^ "Hamilton & Waikato Visitor Information". hamiltonwaikato.com. Retrieved 16 March 2018. ^ Taonga, New Zealand Ministry for Culture and Heritage Te Manatu. "Hauraki–Coromandel". teara.govt.nz. Retrieved 16 March 2018. ^ Taonga, New Zealand Ministry for Culture and Heritage Te Manatu. "Volcanic Plateau". teara.govt.nz. Retrieved 16 March 2018. ^ a b "2009 Waikato Economic Report". Waikato Regional Council. 2009. Retrieved 18 February 2010. ^ a b c "QuickStats about dairying – WAIKATO REGION" (PDF). DairyNZ Economics Group. June 2016. ^ NZ History. Waikato -Manakau Treaty copy. Updated 19 Feb. 2016. ^ a b c "Journal of the Polynesian Society: Maori Flour Mills Of The Auckland Province, 1846-1860, By R. P. Hargreaves, P 227-232". www.jps.auckland.ac.nz. Retrieved 2017-04-23. ^ "WHEAT FIELDS AGAIN. (Northern Advocate, 1931-05-30)". paperspast.natlib.govt.nz National Library of New Zealand. Retrieved 2017-04-23. ^ "Chapter III — Plough and Flour-Mill. | NZETC". nzetc.victoria.ac.nz. Retrieved 2017-04-23. ^ "KORERO O TE POITINI TE KAI TITIRO I NGA MIRA MAORI. (Maori Messenger : Te Karere Maori, 1855-12-01)". paperspast.natlib.govt.nz National Library of New Zealand. Retrieved 2017-04-23. ^ J. Gorst. The Maori King, P11 and Map. Reed. 2001. ^ Maori Enterprise to c1860. Hazel Petrie. ^ The Voyagers.P Moon. p 62. Penguin 2014. ^ J Gorst. The Maori King p 34, 35, 40. Reed 2001. ^ J Gorst. The Maori King. P 39-49. Reed 2001. ^ a b c d Poole, A. L. (1983). "Catchment Control in New Zealand" (PDF). NIWA. ^ "WAIKATO RIVER BOARD. (New Zealand Herald, 1911-09-19)". paperspast.natlib.govt.nz National Library of New Zealand. Retrieved 2017-06-02. ^ "WAIKATO RIVER BOARD (Waikato Times, 1921-12-12)". paperspast.natlib.govt.nz National Library of New Zealand. Retrieved 2017-06-02. ^ "MINISTER ON TOUR. (New Zealand Herald, 1926-10-15)". paperspast.natlib.govt.nz National Library of New Zealand. Retrieved 2017-06-02. ^ "THE WAIKATO RIVER (New Zealand Herald, 1933-08-17)". paperspast.natlib.govt.nz National Library of New Zealand. Retrieved 2017-06-02. ^ "Soil Conservation and Rivers Control Amendment Act 1988 No 48, Public Act 42 Repeal of Waikato Valley Authority Act 1956 – New Zealand Legislation". www.legislation.govt.nz. Retrieved 2017-06-02. ^ a b c d "The work we do". Waikato Regional Council. Retrieved 2017-06-02. ^ "Soil Conservation and Rivers Control Amendment Act 1988 No 48, Public Act – New Zealand Legislation". www.legislation.govt.nz. Retrieved 2017-06-02. ^ a b c d "Waikato United Council | The Community Archive". thecommunityarchive.org.nz. Retrieved 2017-06-02. ^ a b "Local Government Amendment Act 1987" (PDF). New Zealand Legal Information Institute. ^ Taonga, New Zealand Ministry for Culture and Heritage Te Manatu. "Waikato local government". www.teara.govt.nz. Retrieved 2017-06-02. ^ Central, Archives. "Tongariro United Council (mixed)". archivescentral.org.nz. Retrieved 2017-06-02. ^ "Land Transport Act 1998 No 110 (as at 01 October 2007), Public Act 178 Regional land transport committees – New Zealand Legislation". www.legislation.govt.nz. Retrieved 2017-06-02. ^ "Local Government (Auckland Transitional Provisions) Act 2010 No 37 (as at 01 March 2017), Public Act – New Zealand Legislation". www.legislation.govt.nz. Retrieved 2017-06-02. ^ "Public blasts name change". Stuff.co.nz. 2011-04-06. Retrieved 2017-06-02. ^ Adams, By Daniel (2010-10-09). "Rates control popular for Environment Waikato". Stuff.co.nz. Retrieved 2017-06-02. ^ Harper, Paul (15 October 2010). "Voter turnout up in local elections". The New Zealand Herald. Retrieved 16 October 2010. ^ "Final voter turnout 2016". www.lgnz.co.nz. Retrieved 2016-10-27. ^ "Voter turnout". www.waikatoregion.govt.nz. Retrieved 2016-10-27. Wikimedia Commons has media related to Waikato Region. Look up waikato in Wiktionary, the free dictionary.